Students will be able to bridge the spatial and temporal aspects of waves by applying a velocity law. Waves can be described as functions of space or functions of time and these realms are related to one another. The purpose of today's lesson is to bridge the gap between the spatial and temporal aspects of waves by introducing the velocity relationship. After the warmup, I spend a few minutes probing student background knowledge and have them propose a relationship between wavelength and period. That discussion leads into a digital exploration to determine the speed of sound and the speed of light via a simulation. All of today's work helps students to develop facility with the mathematical relationships that are inherent in the period, wavelength, and a velocity of a wave (HS-PS4-1). The exploration also provides students with opportunities to engage in some of the NGSS Science and Engineering Practices, particularly Analyzing and Interpreting Data and Using Mathematics and Computational Reasoning. The warmup problem is exceptionally simple. My main goal is to have students return to their notes about waves as functions of space in order to execute two basic skills: sketching a wave from its equation and creating an equation given a sketch of a wave. I give my students just a few minutes to do this and explicitly tell them that accessing their notes is key. After that time, I reveal the solution and generally discuss the methods involved. As this is truly just a repeat of what we did with functions of time, we address these problems quite quickly. I pause only to reinforce the idea that, though they both describe a single cycle of a wave, periods and wavelengths are as different from on another as one's age and height. Having grounded the conversation in the differences in space and time, I feel like we are ready to proceed with a short lesson linking the two realms. 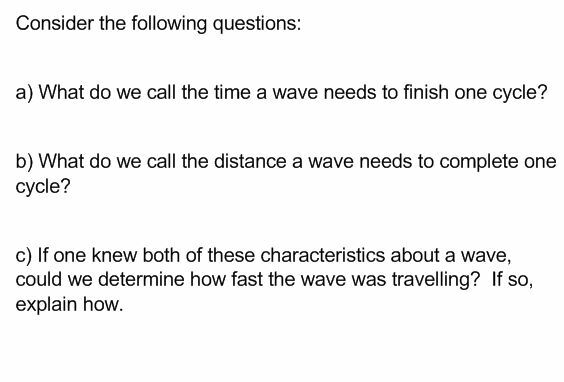 In the next section, I use some simple questions to have students intuit a velocity relationship for waves. On the Smartboard, I show three questions, one at a time to my students. The first two require virtually no thinking at all, as they are merely re-stating some ideas mentioned during the warmup problem. The final question, however, deserves some thought. To address this third question, I ask my students to turn and talk to one another to generate ideas. I give them a minute or two to chat - no written work at this moment, just conversation - while I listen in on their conversations. Insightful comments by students lead me to nominate them when the talk is over. We quickly capitalize on these student thoughts by getting these velocity law equations on the board. The first one is the direct result of student ideas - intuitively students realize that knowing the period and the wavelength of a wave can lead to its velocity. They have distance and time information and can transfer their understanding, from algebra, of the elementary concept of "speed." The alternate version is the result of the period-frequency relationship which I quickly derive on the board, substituting "f" for "1/T." Students write these down in their notebooks and I address any questions that may linger. In the next segment of class, students explore, via simulation, both sound and light and leverage the velocity law. During this investigation, students gain valuable practice with the velocity law and manipulate the settings of the simulation to clearly measure periods and wavelengths of a variety of waves. While I want students to cleverly solve problems throughout this investigation, I also don't want them to needlessly lose time figuring out how to access features of the simulation. To that end, I take a few minutes to demonstrate how to navigate the site using an application (water) that is not part of their upcoming work. I show features like altering frequencies, measuring distance and time, and expanding the field of view. By broadcasting these essential features to all students, I can accelerate the learning curve without removing any of the essential challenges of the activity. 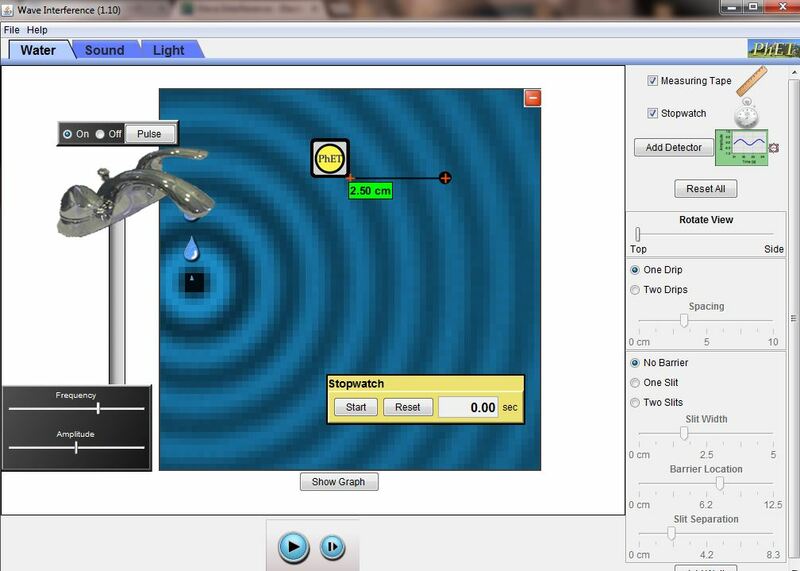 Below is a screenshot of the simulation, showing the dripping water faucet. After addressing any questions about the basic manipulation of the controls, I distribute the instructions and ensure that all students have access to computers. Students access computers - many have their own devices though I make a small number of computers available for those who don't. They may collaborate but each student is responsible for their own responses. I distribute the handout to the wave speed investigation and students begin their work by accessing the simulation through this link. The purpose of this investigation is two-fold. First, I want students to employ the velocity law in a meaningful way. The algebra is simple so the task must have some intrigue to it. So, as a second goal, I want to provide my students with an opportunity to creatively use the features to solve non-trivial problems. One of the prompts in the handout has students estimating the speed of sound (then, later, the speed of light). There are no instructions other than to "develop a technique" which will lead to that estimate. I provide students some information - that the speed of sound should be around 300 meters per second - so that, if they're on track, they can continue. If they are far off the mark, they are prompted to check in with me. Once they have an estimate of the speed of sound, they can leverage the velocity law to convert wavelengths into frequencies. Those frequencies can actually be heard when students are prompted, later in the exercise, to turn on the audio feedback feature of the simulation. So, in the end, students can link the wavelengths to frequencies to pitches and come away with a more holistic understanding of sound waves. A similar sequence is followed for examining the speed of light. Students continue this investigation until the end of class. Early on during this segment of class, I announce that their homework - due two class periods from today - is to complete this investigation should they be unable to complete it in class.